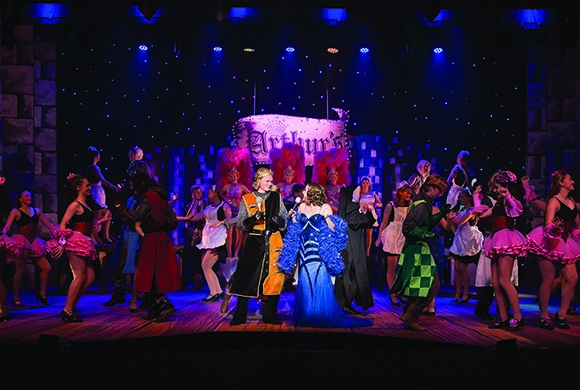 As the season of the 2019 Senior School Musical, Spamalot, draws to a close, we celebrate an event that truly brings out the best in our community. We ask students at Carey to work collaboratively, show respect for one another and to demonstrate courage and resilience. These expectations also need to be reflected in the way we as adults interact with each other. A project like Spamalot gives us the opportunity to do that in a very unique way as staff, parents and allied professionals work closely with each other and directly with students. I would like to thank and congratulate the creative team of Tim Schwerdt, Lisa Callaghan, Sally Davis and Alicia Bendall on a spectacularly successful production. They are supported by too many staff and parents to mention, but I must also thank the Carey Theatre Association for the spirit in which they support the School’s programs. Additionally, our productions are supported by a huge contingent of parent volunteers and their contributions are valued enormously. If you haven’t yet seen this wonderful production, a very limited number of seats are available, which you can book here. Carey’s annual trip to Generations in Jazz will take place from May 3–5. This year we have 58 students going from four different ensembles including Big Band, Stage Band, Conchords (formerly A Cappella) and a small jazz combo. Shortly after this on May 18–20, Vivaldi Strings, Inter Strings, Orpheus Choir and Symphonic Band will travel to Blampied for the annual Autumn Music Camp. This intensive rehearsal camp allows these ensembles to develop repertoire and ensemble skills in a way that isn’t possible during regular weekly rehearsals. Consent and medical forms for the Autumn Music Camp are now due, and we ask families to return these to the music office as soon as possible if they haven’t already done so.